The food journey continues. Once again up early and hungry, we roamed a few small side roads near our hotel and ultimately decided on this restaurant just up the road and across the street. The sign can be Romanized as Geumgang Jeongyuk Siktang. When you're eating out this early, you inevitably run into at least one drunk customer at the tail end of an all-nighter trying to sober up with some comfort food. We experienced this phenomenon at the Soondaeguk place as well. Drunk Koreans are loud and obnoxious! As it turns out, the restaurant is also a butcher shop. What better place to eat a beef dish? 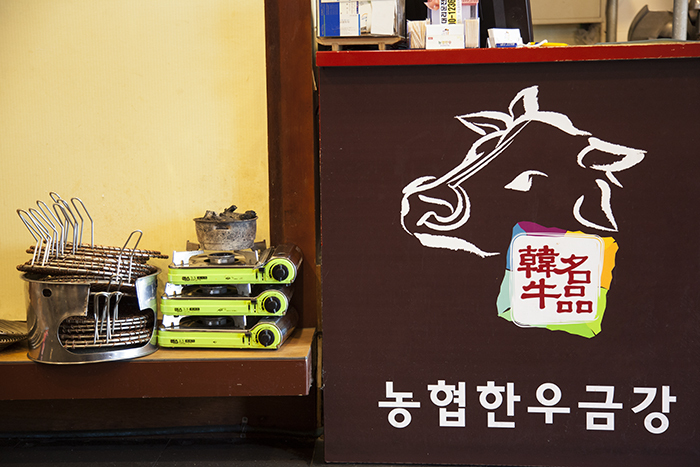 Of course, if I could actually understand Korean, I'd have known from the restaurant name. 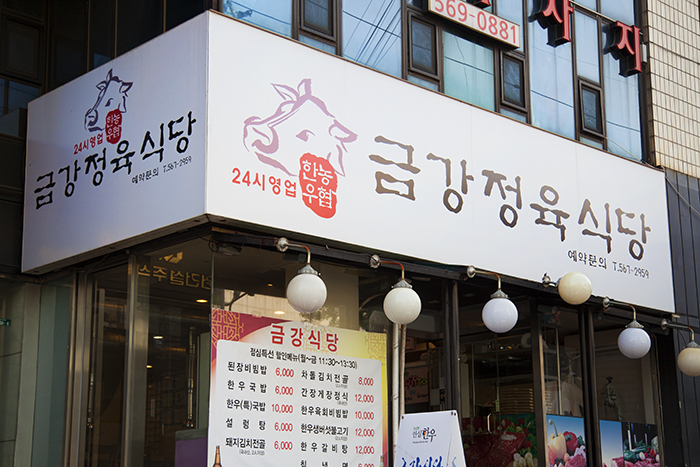 Jeongyuk means meat or a place where one buys meat. (Siktang means restaurant or dining room). You can see the ubiquitous grills and burners used for KBBQ and Jjigae. But we wouldn't be needing them for this meal. And here's the Kalbi Tang. This photo makes me crave for more. It's easily the best Kalbi Tang I've ever had. Along with the Soondaeguk from the first morning, this is one of the dishes from the entire trip that blew me away. Perfectly tender fall-off-the-bone beef in a delightfully comforting broth. I could eat this every day. In fact, I'd happily end an epic night on the town with a bowl of Kalbi Tang instead of Steak and Eggs (the Las Vegas staple).